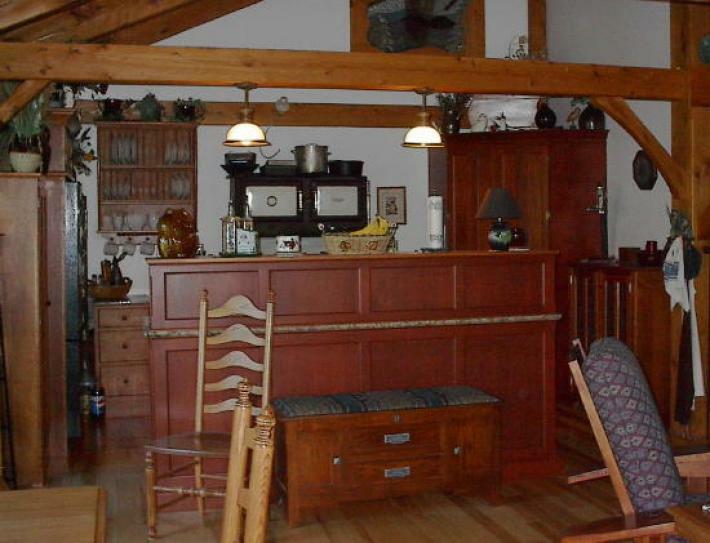 The Keeping Room in this Vermont Post & Beam Home was adding prior to having the kitchen designed and installed. The owners knew that they needed to design a kitchen that would be compatible with the freestanding rebuilt vintage range that was to be their focal point. When they found YesterTec, they knew that workstations would be a good fit for them. So they ordered five of our freestanding workstations that fit so well between the post & beam structure. The Hampton’s Cherry Island Sink workstation separates the kitchen area from the sitting area of the keeping room. The storage piece on top hides the typically messy sink area from view from the sitting area, and provides extra (very usable) counter space and storage. The dishwasher (that was existing from their previous kitchen) was hidden behind our pocket doors. A Natural Cherry refrigerator piece surrounds an exposed black refrigerator that was also existing. A 36″ wide Infill piece that provides more storage and very needed counter space and a 30″ plate rack flank the left side of the vintage range. 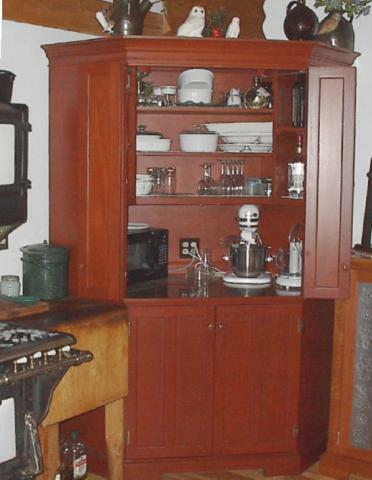 A freestanding Hampton’s Cherry Corner Cupboard conceals the small appliances and the everyday dishes above the countertop with more roll-out storage behind the lower doors. 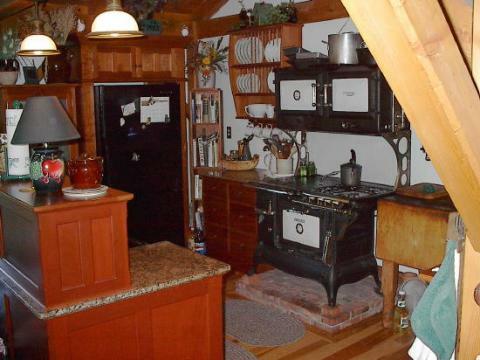 A vintage butcher’s block, a small pie safe (next to the corner cupboard), bookshelves and a larger storage piece (next to the refrigerator), blend in with the unfitted YesterTec workstations to create this eclectic country styled ensemble. Perhaps you can understand why we believe so strongly that in so many homes, workstation furniture is such a great alternative to built-in cabinetry!